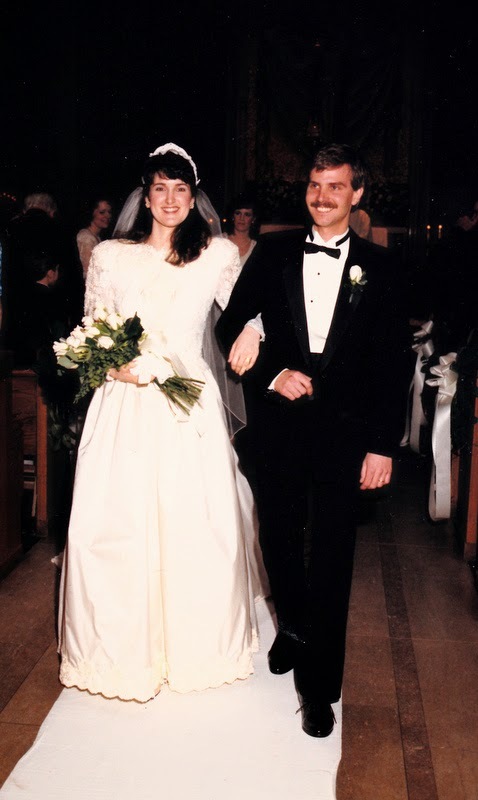 My husband and I celebrated our 25th wedding anniversary a few days ago. 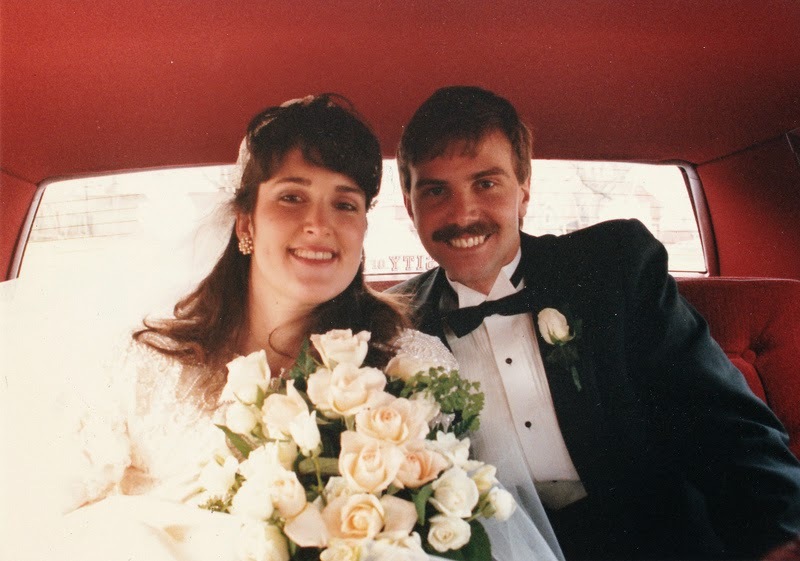 Gosh, we were young, even though we were 26 and 27 at the time. My girlfriend commented on Facebook that it’s hard to imagine a bride today being covered up as much as I was back in the day! The picture doesn’t do it justice, but I had a beaded bodice and the dress was silk. It’s now packed away under my bed. A metaphor? How about our DIY “Just Married” sign? I still laugh at it! 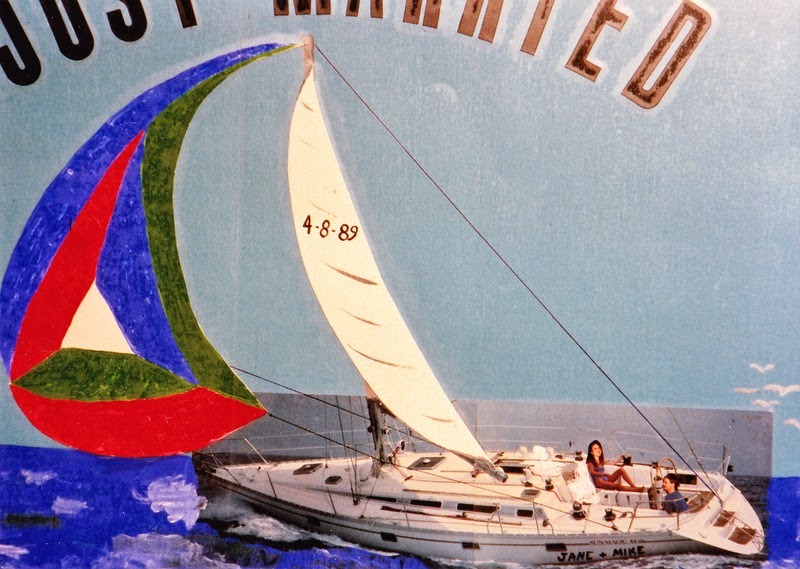 You might remember our “love story.” We cut this picture out of a magazine, plopped our photos on it, and then sketched and painted sails on it! I have been preparing an essay for Sarah’s wonderful series Coming Home. Between that and the anniversary, I have been looking back on photos. Annie dragged out our heavy wedding album. (She presented us with an amazing drawing of the top photo.) The photos are all in good condition, but the thick, vinyl album has deteriorated. It’s all sticky. So I wrapped it in Saran wrap. Is that a metaphor for our marriage? Sticky, messy, but filled with wonderful, happy memories. And then, before I knew it, I was going through old photo albums. Life seems like a dance between births, baptisms, birthday parties, concerts, recitals, and graduations. 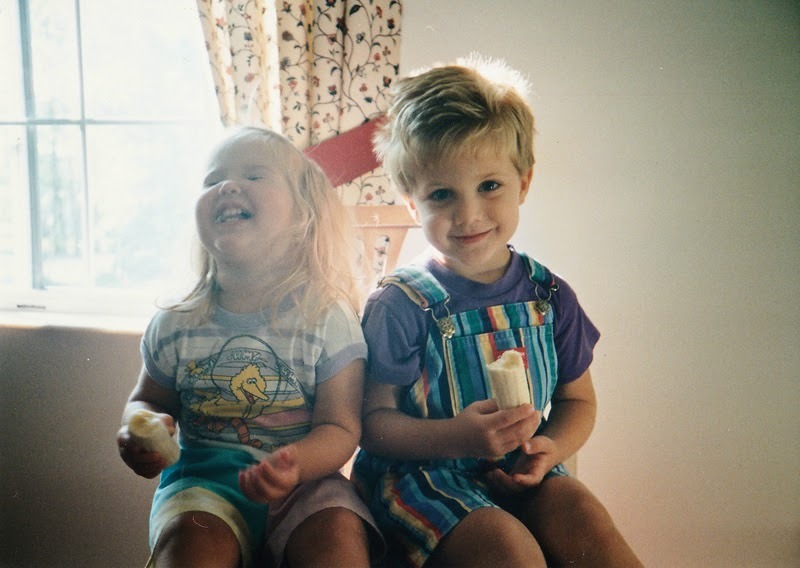 I stumbled upon this photo and love the sheer joy and innocence it captures. Why does it feel like I’ve traveled a long way since then? Going through those photos I also realized how much I have sewn through the years. I might have to make a post about that some day. I made a lot of clothes for the kids and a few for myself. My husband has been – and still is – very supportive of my need to create…even to the point of wearing matching shirts that I made for him and my son! A 25th anniversary is a big deal. Our family likes to have big parties, but it just wasn’t something anyone could pull off. Particularly since it was bookended by two trips. Last weekend my husband spent the weekend with my daughter for “Dad’s Weekend.” This upcoming weekend, we are going to my son’s college for his senior recital. There will be no party, no trip to Hawaii…but perhaps a nice dinner out some day. In our first 15 years of marriage, we only spent one night away from the kids. Since then, I think we’ve managed two more nights visiting my son in college. It’s just not in the financial or time budget at this point in our lives. That doesn’t mean we don’t make our marriage a priority. We do. Our marriage is a framework for our life. Thank goodness, because this week I’ve needed it! Even though my husband once told me “never give him anything else to hang on the wall”….that’s exactly what I did. I made a wall hanging using the lyrics to the song of our wedding “first dance.” I’ll share a DIY on that as soon as he hangs it up on the wall! It was really a sneaky way to start adding a little something to our bedroom. I also bought fabrics to make a new duvet. What we really need is a new mattress. But who wants to shop for that? I’m grateful to my spouse for sharing the journey of life. We certainly need each other to raise our kids – particularly through these teen years. With the demands on us as parents, it’s easy to forget that we are also a couple. But we’ll take the moments we can, because 25 years goes by in the blink of an eye! It does go by in the blink of an eye. Last August my husband and I celebrated 32 years. I just can’t believe its been that long. Where did the years go!!! Congratulations on your 25th. Happy Anniversary! I love your wedding dress! Did you make it.